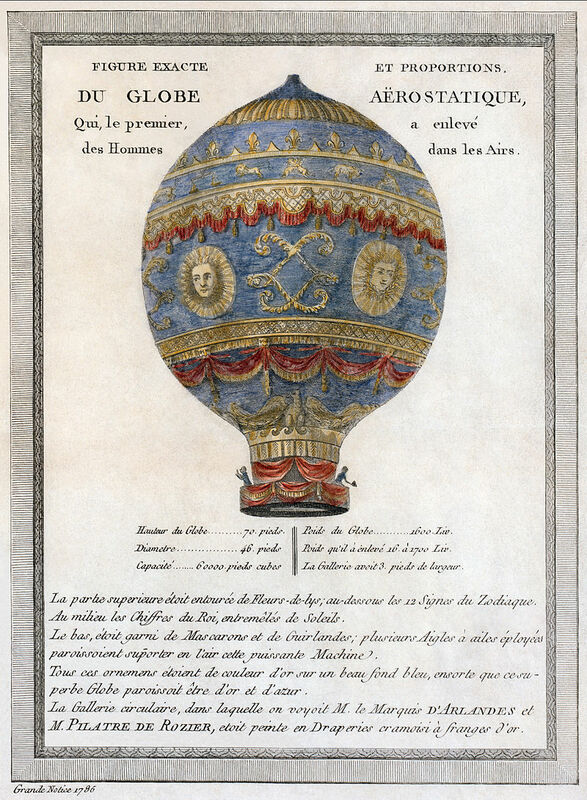 On this date in 1783 Joseph-Michel Montgolfier (26 August 1740 – 26 June 1810) and Jacques-Étienne Montgolfier (6 January 1745 – 2 August 1799) gave their first public demonstration of their Montgolfière (hot air balloon), also known as a globe aérostatique in their home town of Annonay before assembled dignitaries. Their first flight was not piloted and did not contain a payload of any sort. Joseph was the first of the two brothers to contemplate building a flying machine as early as 1782 when he observed laundry drying over a fire incidentally form pockets that billowed upwards. He made his first definitive experiments in November 1782 while living in the city of Avignon. He reported some years later that he was watching a fire one evening while contemplating one of the great military issues of the day—an assault on the fortress of Gibraltar, which had proved impregnable from both sea and land. He wondered about the possibility of an air assault using troops lifted by the same force that was lifting the embers from the fire. He believed that within the smoke was a special gas, which he called Montgolfier Gas, with a property he called levity. As a result of these musings, Joseph set about building a box-like chamber 1×1×1.3 m (3 ft by 3 ft (0.91 m) by 4 ft) out of very thin wood, and covering the sides and top with lightweight taffeta cloth. He crumpled and lit some paper under the bottom of the box. The box quickly lifted off its stand and hit the ceiling. Joseph then recruited his brother writing, “Get in a supply of taffeta and of cordage, quickly, and you will see one of the most astonishing sights in the world.” The two brothers then set about building a similar device, scaled up in length, width, and height by 3 (that is, 33 or 27 times greater in volume). The lifting force was so great that they lost control of the craft on its very first test flight on 14 December 1782. The device floated nearly two kilometers (about 1.2 mi). It was destroyed after landing by the “indiscretion” of passersby. The brothers decided to make a public demonstration of a balloon to establish their claim to its invention. They constructed a globe-shaped balloon of sackcloth with three thin layers of paper inside. The envelope could contain nearly 790 m³ (28,000 cubic feet) of air and weighed 225 kg (500 lb). It was constructed of four pieces (the dome and three lateral bands) and held together by 1,800 buttons. A reinforcing fish net of cord covered the outside of the envelope. On 4 June 1783, they flew this craft as their first public demonstration at Annonay in front of a group of dignitaries from the États particuliers. Its flight covered 2 km (1.2 mi), lasted 10 minutes, and had an estimated average altitude in flight of 1,600-2,000 m (5,200-6,600 ft). Word of their success quickly reached Paris. Étienne went to the capital to make further demonstrations and to solidify the brothers’ claim to the invention of flight. Joseph, given who tended towards an unkempt appearance and shyness, remained with the family. Étienne by comparison was generally presentable. In collaboration with the successful wallpaper manufacturer Jean-Baptiste Réveillon, Étienne constructed a 37,500-cubic-foot (1,060 m3) envelope of taffeta coated with a varnish of alum (which has fireproofing properties). 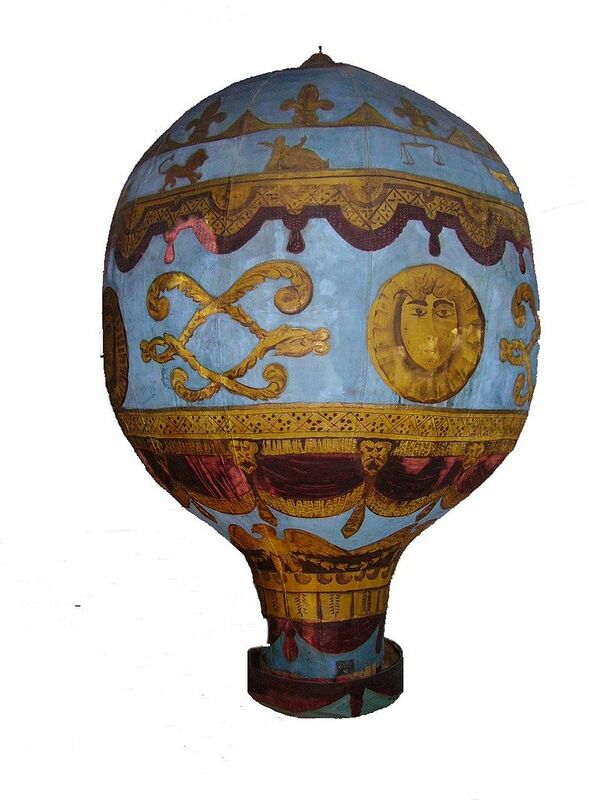 The balloon was sky blue and decorated with golden flourishes, signs of the zodiac, and suns. The design was contributed to by Réveillon. The next test was on 11 September from the grounds of la Folie Titon, close to Réveillon’s house. There was some concern about the effects of flight into the upper atmosphere on living creatures. The king proposed to launch two convicted criminals, but the brothers decided to send a sheep, a duck, and a rooster aloft first. On 19 September 1783, the Aérostat Réveillon was flown with the first living beings in a basket attached to the balloon: a sheep called Montauciel (“Climb-to-the-sky”), a duck and a rooster. The sheep was believed to have a reasonable approximation of human physiology. The duck was expected to be unharmed by being lifted aloft. It was included as a control for effects created by the balloon rather than the altitude. The rooster was included as a further control as it was a bird that did not fly at high altitudes. This demonstration was performed before a crowd at the royal palace in Versailles, before King Louis XVI of France and Queen Marie Antoinette. The flight lasted approximately eight minutes, covered 2 miles (3 km), and obtained an altitude of about 1,500 feet (460 m). The craft landed safely after flying. With the successful demonstration at Versailles, and again in collaboration with Réveillon, Étienne started building a 60,000-cubic-foot (1,700 m3) balloon for the purpose of making flights with humans. The balloon was about 75 feet (23 m) tall and about 50 feet (15 m) in diameter. It had rich decorative touches supplied by Réveillon. The color scheme was gold figures on a deep blue background. Fleur-de-lis, signs of the zodiac, and suns with Louis XVI’s face in the center interlaced with the royal monogram in the central section. Red and blue drapery and golden eagles were at the base of the balloon. 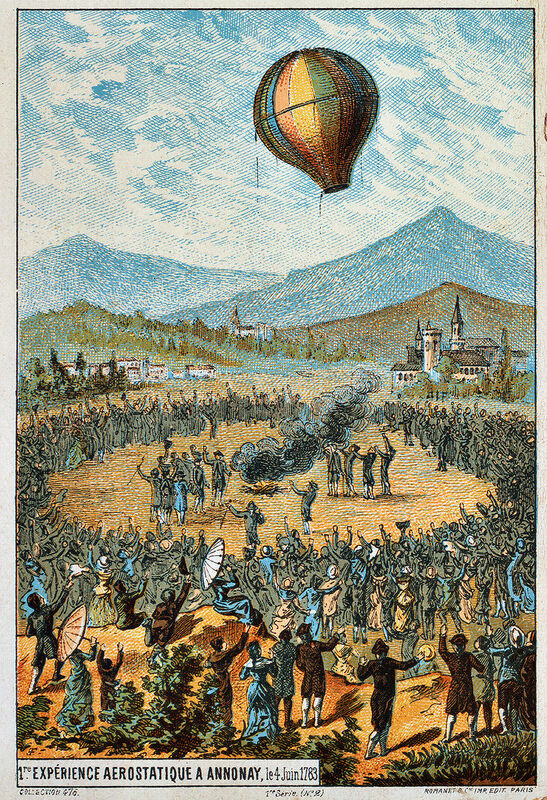 Étienne Montgolfier was the first human to lift off the Earth, making a tethered test flight from the yard of the Réveillon workshop in the Faubourg Saint-Antoine, most likely on October 15, 1783. A little while later on that same day, Pilâtre de Rozier became the second to ascend into the air, to an altitude of 80 feet (24 m), which was the length of the tether. On 21 November 1783, the first free flight by humans was made by Pilâtre, together with an army officer, the marquis d’Arlandes. The flight began from the grounds of the Château de la Muette (close to the Bois de Boulogne (park)) in the western outskirts of Paris. They flew aloft about 3,000 feet (910 m) above Paris for a distance of 9 kilometers. After 25 minutes, the machine landed between the windmills, outside the city ramparts, on the Butte-aux-Cailles. Enough fuel remained on board at the end of the flight to have allowed the balloon to fly four to five times as far. However, burning embers from the fire were scorching the balloon fabric and had to be daubed out with sponges, and also Pilâtre took off his coat to stop the fire. Annonay is famous for bugnes, a raised-dough fried pastry that also goes by the name angel wings in some parts of Europe. That name plus the fact that yeast makes the dough rise makes them seem suitable for today’s recipe. Bugnes can be flat and crispy or soft and doughy. These are the latter. Dissolve the yeast in the warm milk and let it sit until frothy. Sift the flour into a large mixing bowl. Dig a well and add the beaten eggs, warm milk plus yeast, salt, and caster sugar. First with a spoon, then with your hands, combine to form a dough. Knead for 5 minutes. Add the rum, orange flower water and lemon rind. Knead for 5 minutes. Add the butter. Knead for another 10 minutes until the dough is smooth and homogenous and peels off the edges of the bowl. Cover with a cloth and leave for 1 hour at room temperature. After than cover with film and chill in the refrigerator. It can be kept overnight. When ready to cook, take the dough from the bowl and give it a quick knead. Roll out the dough on a floured work surface to a thickness of 4 mm. Cut the dough in to 5 x 5 cm squares. Cut a slit in the middle of each square, then pass a corner through the slit to form a knot. Heat the oil to 160°C/320°F in a deep fryer. Temperature is critical. Too hot and the dough will fry too quickly and brown too deeply. Place bugnes 3 at a time into the hot oil. Let the bugnes swell, then turn them over as soon as they rise to the surface and are golden. Leave them to cook about one minute on the other side.